Misaki Shimakawa is a university student from Japan who visited Sri Lanka last year as a member of a Japanese group of students. Groups of Japanese university students visit Sri Lanka every year. They interact with Sri Lankan university students and, carry out their study tours in Colombo and other parts of the country. As part of the study tour, they explore the socio-economic issues in Sri Lanka and prepare for seminar presentations once they get back to Japan. After completing the Sri Lanka study tour, Misaki has made a presentation about an interesting issue that not many Sri Lankans would have thought of: “Colombo is dark in the night!” Consequently, as Misaki observed, there are higher levels of traffic accidents, sexual harassments, and robberies in Colombo. 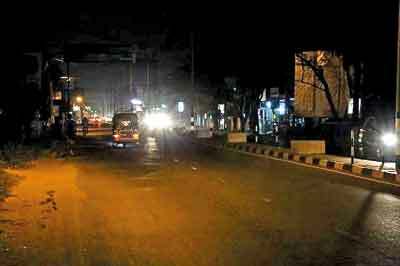 When there is inadequate night light in the country’s capital Colombo, people and especially tourists do not feel comfortable and safe. Together with Misaki, two of her other group members – Haruna and Nahoko, also had interesting presentations that Sri Lankans should not ignore: Haruna’s presentation was about the problem of “stray dogs in Sri Lanka” and its consequences. She also elaborated how the people and the authorities are suffering without a proper plan and a solution and, brought about case studies from Japan, Germany and USA. Nahoko’s presentation was about the habit of throwing trash everywhere and the Sri Lankan struggle to solve the “Garbage Problem”. As a case study, she also reflected how Japan has managed the garbage problem. Japan is one of the cleanest and safest countries in the world and it was not surprising to me that these students picked up from Sri Lanka some pretty obvious and very peculiar issues to them. In both presentations on stray dogs and stray trash problems, they have inferred how both people and authorities have been groping in the dark without any direction. I would be happy to talk about economics of all three issues, but today let me pick up the issue of “economics” of the city in the dark. Generally light means that there are economic activities carried out by people. Therefore, some locations on the face of the earth illuminates with lights in the night where there are economic activities and people. The Western Province in Sri Lanka (where Colombo is located) has the highest concentration of the country’s economic activities and the people. About 5.8 million people (29 per cent of Sri Lanka’s total population) live in the Western Province, generating US$32 billion worth of GDP which is over 40 per cent of the country’s total GDP. The Tokyo metropolitan on the other hand has 35 million people (28 per cent of Japan’s total population) who generate $1450 billion worth of GDP which is about 32 per cent of the country’s total GDP. 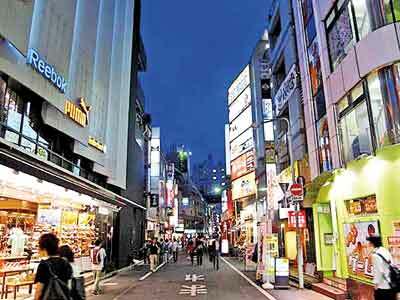 Thus, Tokyo is much bigger than the entire Sri Lanka in terms of population. However, it is also much bigger than the Western Province of Sri Lanka in terms of per capita income as well: GDP per capita of the Western Province of Sri Lanka is $5,690 compared to over $40,000 in Tokyo. The Western Province has 24 per cent of the country’s electricity accounts, contributing to 37 per cent of the country’s total electricity sales and 47 per cent of revenue from electricity sales. By national standards, the electricity usage in the Western Province is overwhelmingly higher than rest of the country; but still Colombo is in the dark! Colombo sleeps at night too. Many other cities in the Asian region are illuminated with night lights because for them there is little difference between day time and night time. But Colombo, just after late evening goes to sleep. I am not referring to night clubs and casino clubs, which are anyway operating in Colombo too. I am specifically referring to normal economic activity such as travelling, shopping and eating out. There might be historical reasons for Colombo not to emerge as a city with night life and one of them probably is the sense of fear and insecurity. Therefore, night is the time to be safe at home. Colombo, which is limited to a relatively tiny geographical location, is not a residential area as such since millions of people who gather in the morning rush leave the city before sunset. Light means energy consumption in economic activities. Thus, electricity consumption projects the volume of economic activity and the intensity of electricity usage in such activities. It is surprising that, even being a lower middle-income country, Sri Lanka is one of the few countries in the region with the lowest level of electricity consumption. 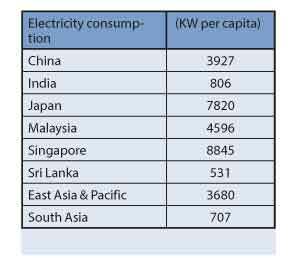 According to World Bank data, Sri Lanka’s average electricity consumption per person is 531 kw compared to South Asian average of 707 while the East Asian and Pacific average is 3680 kw. Thus we have an important puzzle to sort out: Why is Sri Lanka so poor in electricity consumption? The most plausible reason is the higher electricity prices in Sri Lanka. Sri Lanka’s average electricity tariffs are considered to be high by international standards even after the reduction of tariffs a few years ago. Colombo is in the dark not only because of the smaller volume of its economic activities but owing to the higher price of electricity which is a vital input in such economic activities. People in Sri Lanka do not use electricity like those in other countries, because electricity is expensive for households and businesses. If Sri Lanka’s electricity prices are relatively higher, then it is a valid reason to argue that the country has lost the cost competitiveness of its economic activities. It is not necessary to explain that higher electricity prices affect our export competitiveness, in addition to its negative impact on living standards. What is bizarre is that even with higher electricity prices in Sri Lanka, the Ceylon Electricity Board (CEB) is making losses! The operating losses of CEB in 2017 is in excess of Rs. 39 billion, as reported in the Budget Speech 2018. This is about 2 per cent of the government’s total tax revenue compelling us to pay more taxes to cover the CEB losses too. In fact the CEB is only one of many institutions in which losses have to be taken care of by taxpayers. With the introduction of the Statement of Corporate Intent (SCI) for just five of the state enterprises including the CEB, these state enterprises are expected to enhance oversight and financial discipline, according to the Annual Report 2016 of the Treasury. Until and unless it happens, taxpayers have to bear the losses. As long as someone else (people) is there to bear the losses, there is hardly any incentive or rationale for anyone to enhance oversight and financial discipline. When the spoon is in your hand, help yourself! Historical data confirm that electricity demand and economic growth moves closely due to both ex-ante factors (because industry and commercial demand for electricity pushes economic growth) and ex-post factors (because income growth pushes household demand for electricity). According to the CEB, electricity demand will double within 15 years (2015-2030) by growing at over 5 per cent per annum. If there is an acceleration of the rate of growth, the corresponding electricity demand is expected to rise even further. If the country is not investing in electricity generation, the power shortage will constrain the potential economic growth. And more importantly, investment in power generation is a multi-billion mega project that extends over many years so that you need to hold your growth prospects for that period of time.